Kickstands are typically used to allow things to rest in a stationary position. Well, New York could use a rest from the scalding heat and humidity currently hanging around town and the Detroit, Michigan duo of The Kickstand Band seem all too ready to oblige this need for relief with a new EP that’s ideal for getting one’s mind off the oppressive temperatures, despite its hot weather connotations. Laying atop everything are the duo’s echo-laden vocals, which, when combined with their affinity for tightly knit parallel harmonies, create a very pleasant quality akin to something best described as sonic watercolor. Latched together in classic major third interval fashion, Smith and Young’s teamwork gains an extra boost from the fact the reverb means their vocal parts don’t stay exactly in-between hard and fast lines, even though the actual notes follow a pretty standard path. This stylistic choice is just one of the ways The Kickstand Band are able to establish and help internalize allusions to their love of everything summer, without banking on similes and metaphors alone. There isn’t a lot that needs conceptual dissecting where the narratives of Summer Dream are concerned. Settings stray only as far as the distance – literal or emotional – created or resolved in a seasonal love story (Half a year ’til we’re in love again / I’ll be waiting). What’s most intriguing however, is that in an EP of only five songs, The Kickstand Band have decided to reserve the outwardly spoken positivity for the aforementioned cover tracks. (“It’s good to be alive”, “Love is everywhere / We don’t have a care”) Melodically the duo’s three originals have ample catchy energy (the fluttering lead guitar solo on “Stay Inside” and the undulating, major scale-like passages sung by Young on “Fall Back” provide plenty of compositional sweetness) but, in reality, their words resonate with struggle more than easy peace of mind, (All good things disappear / just accept it this year) where one would presume to be while having a summer fling. Initially, the EP plays out like a run of jangly, sing-a-along worthy, summer driven tracks that deserve the descriptor of “just another” placed in front of them. Yet, at less than 15 minutes in length, many repeat plays are easy enough to fall into and once listeners have experienced this Summer Dream a few times over, The Kickstand Band’s thoughtful contemplation of record assembly will shine through – and when considered in conjunction with how Summer Dream was actually brought to completion, (the explanation below given on the duo’s Bandcamp page) the EP’s subtlety with substance is that much more of a pleasant surprise. 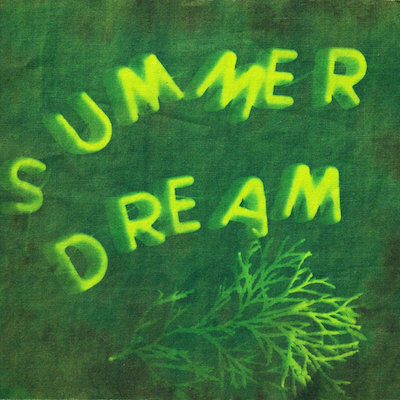 Summer Dream is available now through Bandcamp.